Need a simple solution to help you organize your contacts? Our lead management tool is an easy-to-use and lightweight solution that helps commercial real estate professionals organize leasing and sales activity for any property. 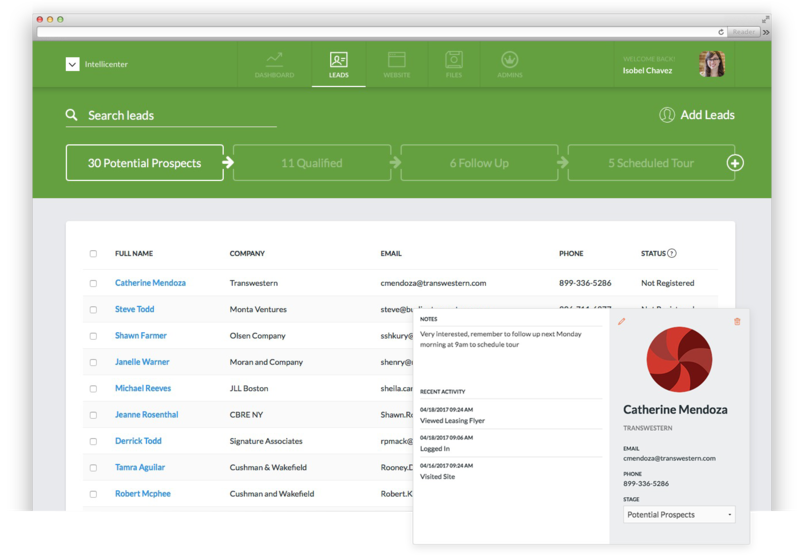 Manage your leads, get a snapshot of their activity, and know the status of deals for any given property. Get a visual snapshot to quickly know the health of your sales or marketing pipeline. Track activity of your leads so you know what they're doing, who is engaged and who to follow up with. Organize and manage all of your leads from one single dashboard to help scale your lead generation. Some common questions about our lead management solution. How do I add leads? You can add leads via a mass import of an Excel file or you can manually add them one-by-one. Also, anyone that registers to access your document portal will be automatically saved as a lead. Can I export the leads? Yes. You can export leads from any of your stages via a CSV file that will include all contact information. You can use this file to import into your own system or other 3rd party tools you are using. You do. These are your contacts and we never share this information or make it accessible to anyone. Only the admins that you assign to the property will have access to your list. Can I share leads across other properties? Yes. You can easily duplicate and share your leads from one property to another one, or across your entire portfolio. This saves you time so you don’t have to re-enter contacts for each property. How is this different than a CRM? Our lead management tool is an easy-to-use and simplified CRM solution that was specifically created for the needs of commercial real estate professionals. No. Our lead management tool is included with all SharpLaunch plans. There are no extra costs to use this tool and you can add unlimited contacts. Need a Lead Management Solution for your Property?